This book is in my cart at Amazon.com. I have to decide if $467.62 – discounted $157.38 from it’s original price – is the way I want to spend my Chinese New Years money. The photography is as amazing as the recipes. The authors ( Nathan Myhrvold, Chris Young, and Maxime Bilet) and their 20-person team have mastered amazing new flavors by using water baths, centrifuges and ingredients such as emulsifiers and enzymes. 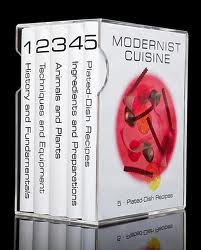 It is a work of art that is destined to reinvent the way you cook and reminds you why you should have studied Microbiology in college. At 2,438 pages and 40 pounds, this multi -volume cookbook may just be an indispensable encyclopedia for genuine foodies. Stay tuned.